As mentioned earlier, the CLS port range falls into the TCP 50000-59999 range, which is also legitimately used for Edge Media Relay service. So it is included on the list of external port ranges that may be open on the external firewall. I say may be opened because this range of TCP ports does not need to be opened inbound (as per the guidance from Microsoft) unless you are federating to OCS 2007, or in the more complex scenario when you are using NATing with DNSLB on the external edge and your firewalls do not support hairpinning (ie. traffic coming from one Edge server’s NATed external public IP address back in to another Edge servers NATed External Public IP address) of media between multiple edge servers in the same pool. Another legitimate reason for this is when you want an optimised media path that does not require tunnelling via port 443/3478 to get to the required 50000 range media port. These scenarios were explained in a great amount of depth by Bryan Nyce and Thomas Binder at Lync Conference 2014. I suggest you watch these videos several times if you don’t understand what I’m talking about here. 'So what percentage of companies actually open the 50000 range of ports to the internet?' I hear you asking… Well, I also wondered this, so I decided that I might do some research and find out. I tested approximately 250 Edge servers of some of the largest organisations in the world and found that approximately a quarter of them have the 50000 range open (with CLS ports showing). So quite a large number of organisations currently have this issue. The actual security implications of having these ports open on the Internet is not fully known at this stage. The existing ClsController.exe application and CsCls Powershell commands supplied with Lync do not allow the user to connect to servers outside of the Lync pools within their installation. So it's certainly not the case that you can use them to randomly connect to other organisations' Edge servers and start logging service. It's my understanding that Microsoft is aware of this issue and have not yet done anything to change the behaviour, so they obviously have deemed it low risk. In my opinion though, the reduction of attack surface is always a good idea for internet facing services. So my recommendation is to block these ports because they serve no practical function externally. 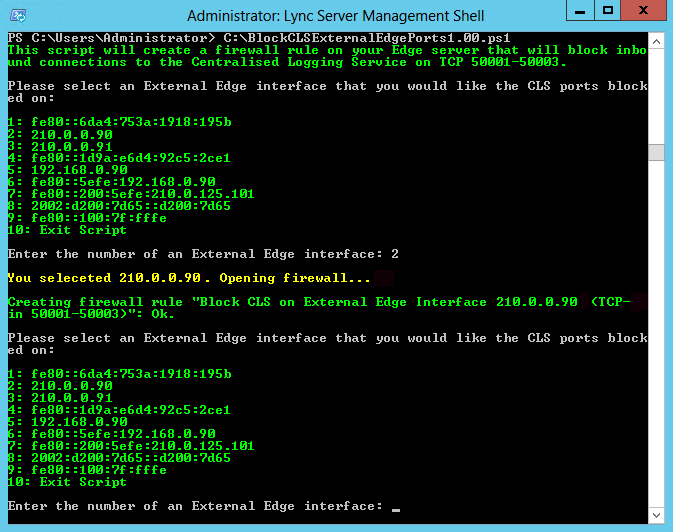 I have written a Powershell script that will block the CLS service ports on selected interfaces of your Edge server. This will function as a work around until Microsoft decides to formally change this behaviour in the product. When you run the script it will display a list of IP Addresses on the server that you can choose to block the CLS service on. You simply need to enter the number of the interfaces in the list that you would like to block access to the CLS ports on. The script will then automatically create a new firewall rule to block TCP ports 50001-50003 inbound on the selected IP Address to the CLSAgent service on the machine. Follow this process for all externally facing Edge IP Addresses (ie. Access Edge, AV Edge and Conferencing Edge IP Addresses). 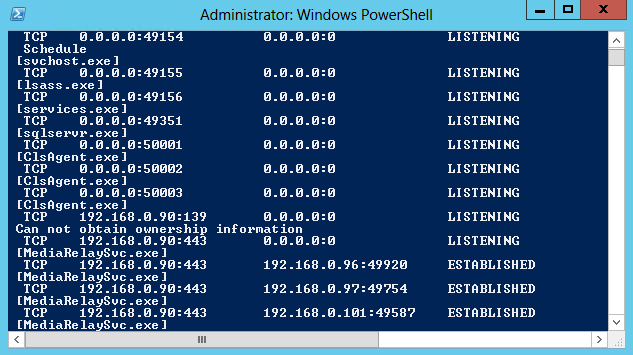 Note: Run Powershell as Administrator when running the script. Security is important and we all need to try to understand what we are asking when we tell the firewall team to open internet facing firewall ports. Whether you are deploying a new Edge server or already have an Edge server out in the wild, then I suggest you implement my firewall work around. Enjoy and see you next time. Ciao!